This post seems to get a lot of visits so there must be people who enjoy seeing Masterpiece Dolls. The easiest way to find more photos of my Masterpiece Dolls in my photo blog is to use the Search tool I’ve added on the sidebar on the right. Just type in Masterpiece (or Ethan, or Faith, or Christopher ) and a list of posts about the dolls will show up. I had the 90mm f/2.8 lens on the camera this afternoon and I did remember to check my settings. I took Ethan outside with me today. 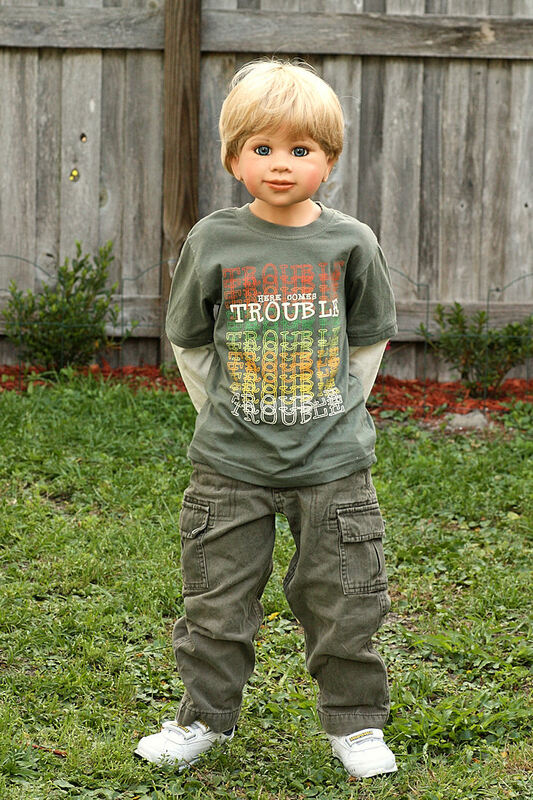 Ethan is one of my largest dolls, a 40-inch little boy by Monika Levenig for Masterpiece Dolls. 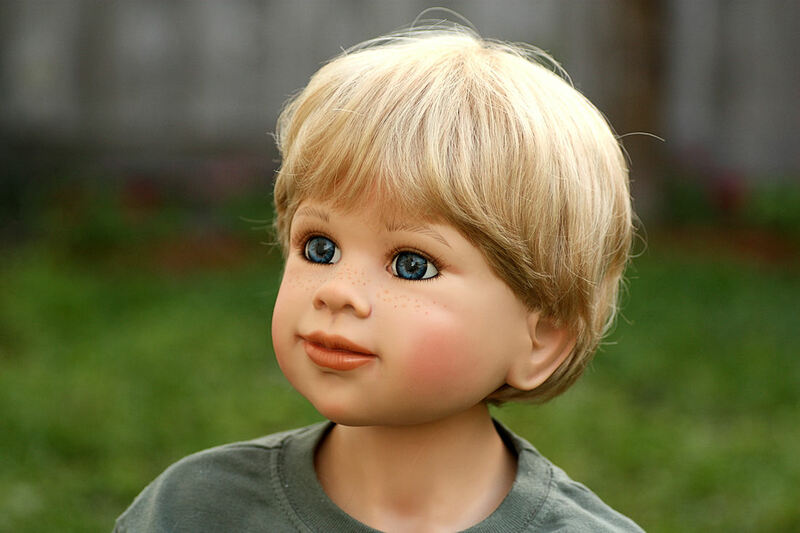 He is a life-size 4-year-old with blond hair and blue eyes. Here’s Ethan, redressed in real little boys’ clothes. You can see that he can stand up by himself. Settings were f/8, 1/60, ISO 800. 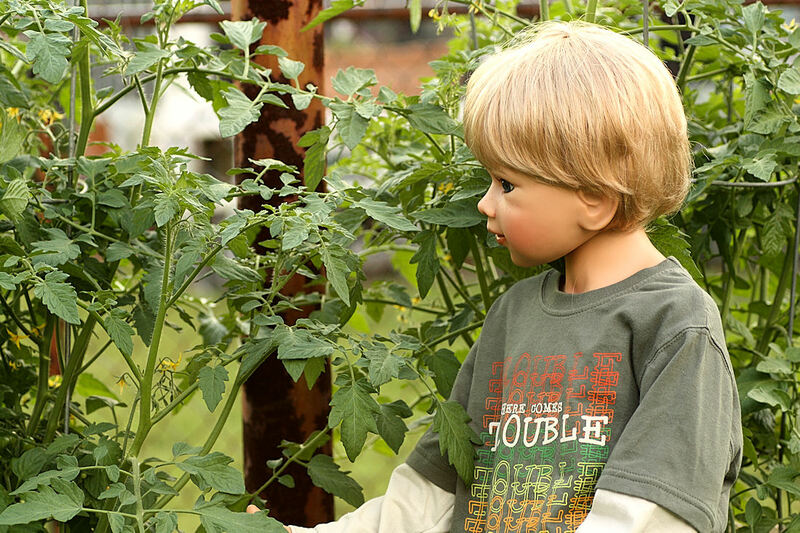 Here’s Ethan with the tomato plants. He’s fun to pose because he’s life-size. Settings were f/4.5, 1/100, ISO 250. 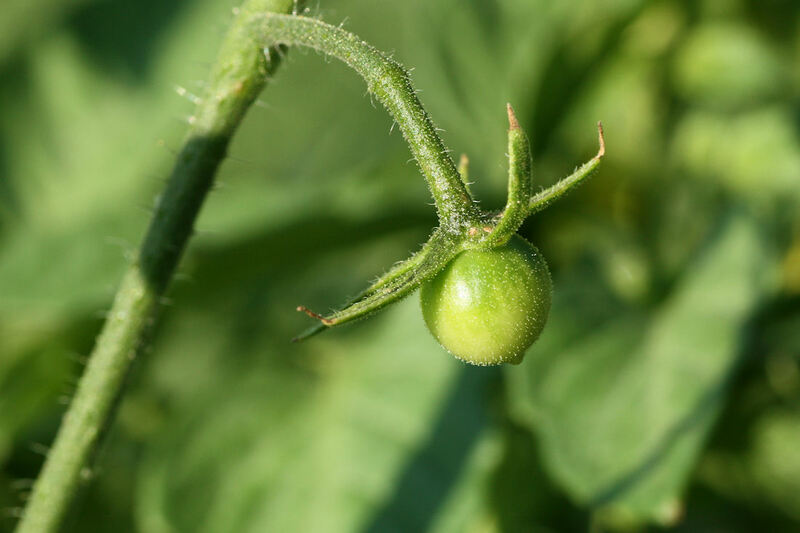 And here’s a little tomato. Settings were f/10, 1/100, ISO 200. 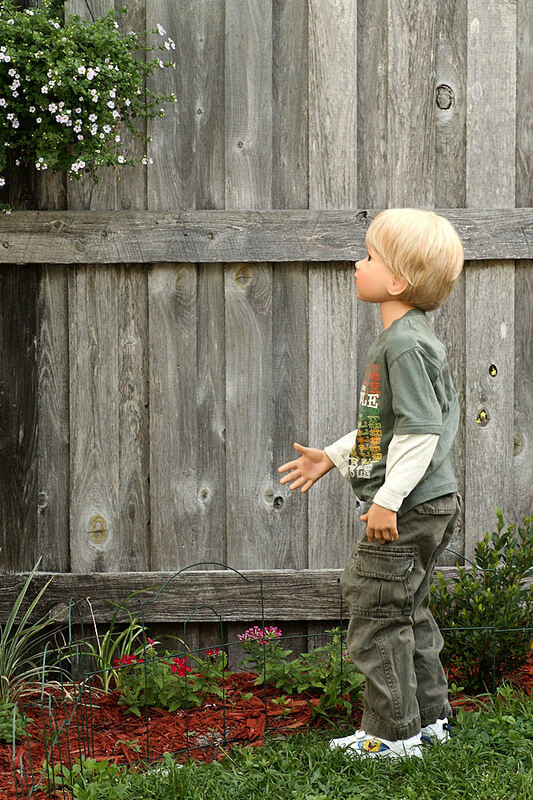 Ethan is looking up at the hanging plant on the fence. Settings were f/6.3, 1/100, ISO 640. 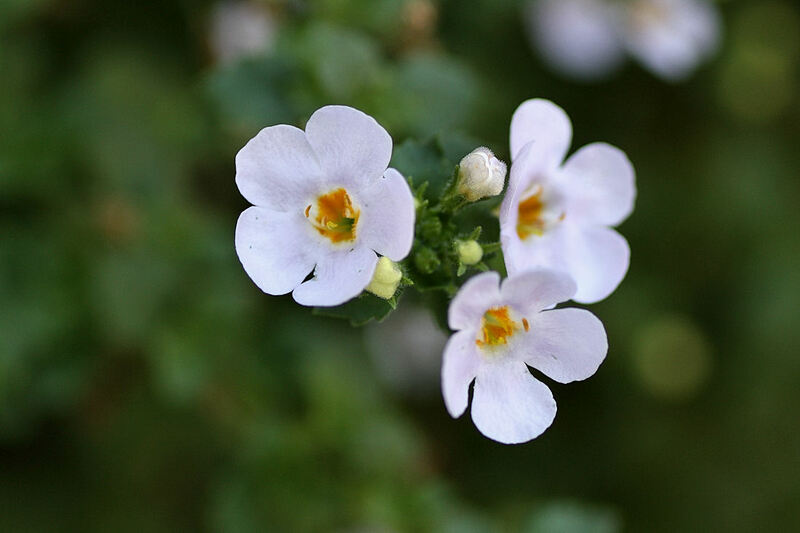 These are flowers from the hanging plant. Settings were f/3.5, 1/125, ISO 200. 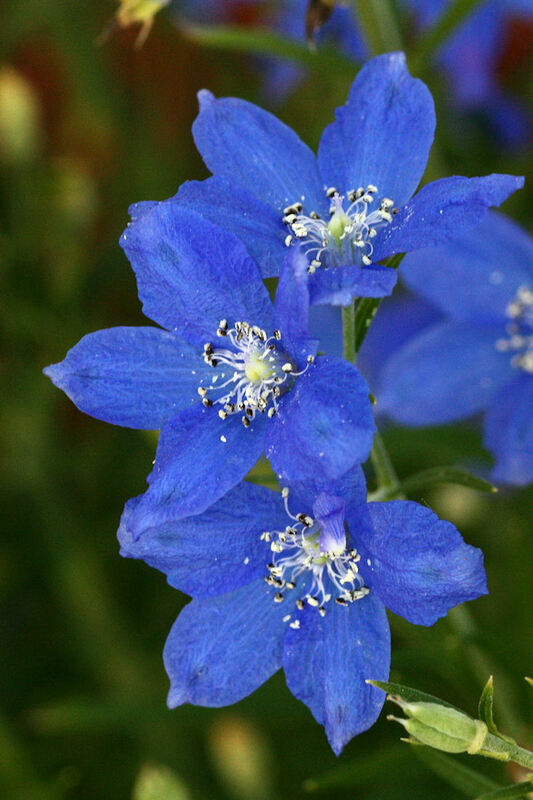 Some blue delphiniums are blooming now. Settings were f/8, 1/100, ISO 800. This is a close-up of Ethan. He didn’t come with freckles–I painted them myself. Settings were f/2.8, 1/160, ISO 200. I wanted a photo of Ethan with Sophie, but Sophie refused to sit close to him. This isn’t a great photo but it’s the only one I could get of Sophie with Ethan. Sophie is posing nicely for the camera, but that’s as close as she would get to Ethan. Her tail and part of his shoe are cut off because I couldn’t back up any farther to take the picture–if I did, Sophie would get up and try to walk away. Settings were f/2.8, 1/160, ISO 100. 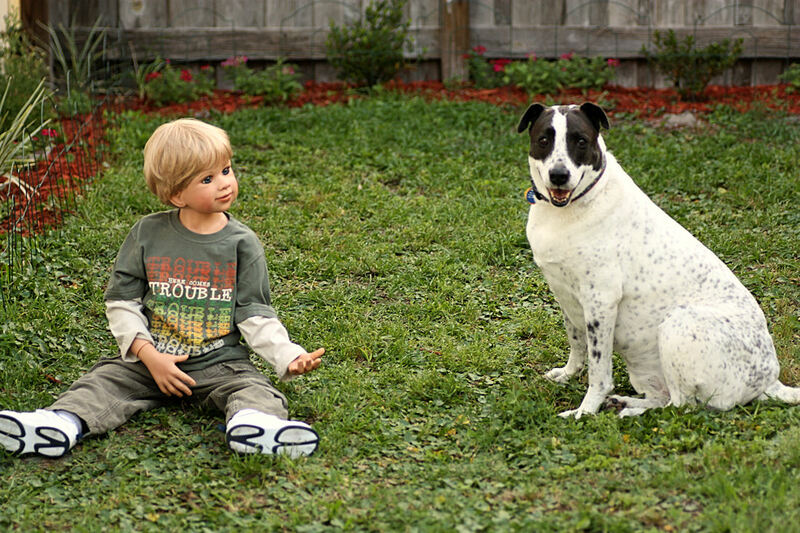 Thanks for commenting on Ethan–he is one of my favorite dolls. I got him back in the fall of 2009, when he was released by Masterpiece Dolls. I saw his pictures and immediately bought him from a dealer on ebay who sells a lot of Masterpiece Dolls. Masterpiece puts out limited editions of a small number of dolls a few times a year, and once those are sold, there aren’t any more. I think Ethan has sold out everywhere by this time. Every now and then I see him for sale by an owner on ebay, so you might want to watch for him there. Thanks so much for the info, i have been looking but they are very expensive on eBay and could not find Ethan anywhere so i guess ill keep looking, again thanks. My friend has an Ethan they may be willing to sell. Do you have a name and number of your friend with an ethan for sale? I love your photos of Ethan. He’s such a sweet boy. Recently an Ethan came to live with me and he has already become one of my favorites. Mine does not have freckles though. I like the addition however. Thanks, Sonny! I added the light freckles to my Ethan myself, and I like him with freckles. I just have two Masterpiece kids, Ethan and Faith. I love that they are so big, really life-size, but I don’t have room for more–well, maybe one more if just the right one came along. I have lots of Twinns and many of mine are boys too. It’s nice to meet someone else who likes those little Twinn boys! Evan, good luck–keep watching for him and you just might find him. Sonny just posted here that she has a friend who may want to sell her Ethan. You might also like to go to the Masterpiece Dolls website ( http://www.masterpiecedolls.com/ ) to see the group of dolls they are currently selling. They don’t have any boys in the August group, but you never know when another cute little boy like Ethan will come along. It’s amazing how realistic and lifelike he looks. The clothes looke really nice on him. If you wouldn’t mine, could you answer some questions I have? -Is Ethan your name for him or did he arrive with that name? -What was he wearing befor you changed his clothes? -How did you paint his freckles on? -How did you come by Ethan? Sorry for the plethora of questions, I’m just really curious. And Thank you in advanced. Thanks for all your comments and likes, Jovanni! Ethan is the name he came with from Masterpiece Dolls. He was in their 2009 collection. I saw him on the Masterpiece Dolls website, and loved him at first sight. I bought him from a Masterpiece dealer on ebay. He came in long shorts, a tee shirt, and a button-up shirt over that. His clothes were okay but more the quality of doll clothes than real kids’ clothes, so I prefer to dress him in kids’ clothes. I painted his freckles with very watered down light brown acrylic paint and a tiny brush. I hope that answers your questions! I’d love to buy an ethan if you could get me in touch with a buyer. I’m sorry but I don’t know anyone with an Ethan for sale. I did see Ethan on ebay not too long ago–if you watch for him there he might turn up again. Good luck in finding him! I want this doll, I will pay any amount of money to own this doll. Do you want to sale. My son wants this doll so bad so I thought I’d ask you or where I could find one like this. Hi Kevin, isn’t Ethan great? He is one of my favorite dolls and one I’ll always keep–I can understand how you and your son like him so much. Ethan came from Masterpiece Dolls in 2009 and is no longer being made. Masterpiece Dolls produces limited numbers of a small group of different dolls a few times a year, and once they’re gone, that’s it. I see Ethan on ebay every now and then (search for Masterpiece Dolls Ethan) and you might be able to find him there. You could also look at the newer dolls at http://www.masterpiecedolls.com . You may see another one you like that’s currently available. Good luck in your search! No, I’m not selling him. He’s one of my favorites. But there are lots of other Masterpiece dolls available at the Masterpiece Dolls website, on ebay, and from online doll shops.